oil produced in the large refineries does not find its way out to more remote and distant rural areas. high transport costs are involved in wide distribution of cooking oil so increasing the price of oil. small farmers produce oilseeds such as groundnuts for sale to the large refineries which they then buy back, at high cost, in the form of cooking oil but without the valuable high protein oil cake. the crude oil is used to produce added value products, most commonly soap. more unusual, high value oilseeds are available; examples include Brazil Nuts, Macadamia Nuts. In many countries the oil processing sector is highly politicised and regulations exist which make entering the market difficult and tend to support the monopoly of the large processors. Large refineries may, for example, insist that farmers sell all their seed under a contract. In other cases seed has to be sold to a central Government marketing board, the board also supplying seed for planting. To determine whether small scale processing is likely to be economic it is most important to first investigate the local situation and regulations. Clearly there must be sufficient raw material available locally. One factor that will greatly influence the viability of the enterprise will be the amount of credit needed to purchase a stock of seed. The enterprise should aim to keep the minimum stock of seed but always have enough to continue operating throughout the year. This requires considerable working capital. Most small enterprises will find that small expellers are the best technology choice. Methods such as water extraction and manual pressing only produce small amounts of oil per day, the extraction efficiencies are low and labour requirements high. Solvent extraction while highly efficient involves very substantial capital cost and is only economic at large scale. There are also health and safety risk from using inflammable solvents. The basic steps involved in processing oilseeds by expeller are shown in the flow diagram below. pre-extraction equipment; eg dehullers, seed/kernel crackers, roasters, mills. equipment for basic refining of the oil; filters, settling tanks. The specific equipment required will depend on the particular crop being processed, the final oil quality required and the scale of operation. In a small guide it is impossible to cover both the whole range of technical options and possible crops the following section concentrates on one example; the extraction of sunflower and groundnut oil by expeller. Most oil bearing seed need to be separated from outer husk or shell. This is referred to as shelling, hulling or decortication. Shelling increases the oil extraction efficiency and reduces wear in the expeller as the husks are abrasive. In general some 10% of husk is added back prior to expelling as the fibre allows the machine to grip or bite on the material. A wide range of manual and mechanical decorticators are available and typical examples are shown in Figure 2. Pre-heating the seeds prior to expelling speeds up the release of the oil. Pre-heating is generally carried out in a steam heated kettle mounted above the expeller. A wide range of makes and sizes of expellers are available. In India in particular a number of efficient small or "baby" expellers are available. A typical example with a capacity of up to 100 kg/hr is shown in figure.3. This machine has a central cylinder or cage fitted with eight separate sections or "worms". This flexible system allows single or double-reverse use and spreads wear more evenly along the screw. When the screw becomes worn only individual sections require repair thus reducing maintenance costs. As the material passes through the expeller the oil is squeezed out, exits through the perforated cage and is collected in a trough under the machine. The solid residue, oil cake, exits from the end of the expeller shaft where it is bagged. The crude expelled oil contains solid particles. These can be removed by allowing the oil to stand and then filtering the clear oil by gravity through fine cloth. A better but more expensive method is pumping the crude oil through a filter press. If filling into retail packs is planned a simple manual piston filler would be required. Economic viability will be greatly increased if the mill works double shift. In terms of employment a small oil mill would provide work for the owner/manager and four workers. Note: This list of suppliers does not imply endorsement by Practical Action. This machine is used for "air washing" of the material to remove all dust, lights and impurities which are lighter than the seed. Winnowing of harvested and threshed seeds. Oil Expeller: Food Groups: Oilseeds, Capacity: 5 litres/hour. Power: Electric. This Howtopedia entry was derived from the Practical Action Technical Brief Small scale oil extraction. 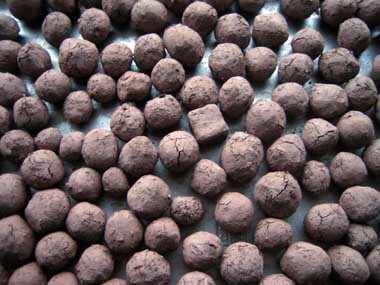 Seedballs are based on the work of Fukuoka Masanobu (Author of "The One Straw Evolution"). It is a method of encapsulating compost and plant seeds within a big "marble" of clay, which can then be dropped, rolled or hurled into a location of one's choice. While in the nature, the balls are protecting the seeds from being blown away by the wind or washed away by water, eaten by animals or desiccated in the sun. When there is enough rain water, the seedballs melt and the clay acts as a reservoir keeping the young plant moist. By choosing several plant species which are appropriate to each type of target area (eg. shade-loving plants, or fast growth "hardies") we can then let Nature decide which plant will flourish in a particular microclimate, rather than forcing the issue as in the case of tree planting. Gathering seeds is a pleasure and a person can make several hundred seedballs in a day. It's a very gentle and mellow activity, that children may also enjoy. This technique is quite powerful, so be sure that you use only native, non-invasive plants!!! There might be some work in preparing the seeds between collection and seed-balling. Also, not all seeds can stay "alive" (keep the ability to germinate) in the clay ball long enough before they get the chance to germinate. The seeds may take some time to sprout and grow. Maybe even only the next season. This is not an instant rewarding action, but many seeds have good chances to grow under these conditions. The clay can either be harvested from the nature, in dry riverbeds for example. It is practical to have it in powdered form, so dry it and grind it up if it is wet. The compost is organic matter and already contains the microorganisms that will help the plant's roots to take nutrients from the surrounding soil. It can be either homemade or you can buy it by a farmer or in a gardening shop. The seeds can either of one only plant to have a monoculture or a combination of many seeds for reintroducing biodiversity and reclaiming dead areas. Ideally have a mix that includes types of seeds that will do well in a variety of conditions appropriate to your climate and needs. The best is to gather local seeds of wildflower and grass: thanks the seedball method you can enhance their reproduction in your bioregion. Mix the clay, seeds and organic compost together in a big pot and add enough water to form a thick paste. Form this paste into little balls about the size of a marble. Let them dry in the shade into hard little balls. To apply, throw the seedballs where you want to spread the plants. The clay protects from predators. The seeds actually sprout inside the ball and take hold. You don't need to PLANT the seedballs in the soil...! The seeds are already planted in the balls. Fencing the area where you spread the seedballs will protect the young plants from being eaten by mammals, and will stronly improve the implantation. This page was last edited on 3 August 2010, at 18:03.